A popular indulgence among women is eyelash extensions. The process of applying extensions just got easier as Utah State University Eastern Cosmetology Department already filled a class spring semester and another summer semester. 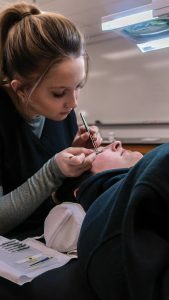 “This is the first school to be certified by Borboleta to teach lash extensions, outside of its Salt Lake City headquarters,” Debbie Prichard, associate professor said. “The Eastern instructors believed the Borboleta education stands out in the industry with a reputation for outstanding work and professionalism. “They are the top-lash-education provider in the world and that’s why Eastern instructor, Jessie Lobato trained and certified in its program,” Prichard said. Lobato brought back the theory and fundamentals of lash artistry and techniques to use in the USU Eastern program. With hands-on mentorship experience and the salon environment, Prichard is ecstatic to bring the classes to Price. The lash industry is growing rapidly and creating an education course on this campus adds more learning experiences to the cosmetology program. The financial assistance of Assistant Vice Chancellor Jamie Cano and Vice Provost Gary Straquadine, helped bring the program to the Price campus. It will be housed in a state-of-the-art facility at the McDonald Career Center and taught every other Friday from 6-9:30 p.m. and Saturday from 8 a.m. to 4 p.m. The limited classroom size allows six students per class. A student must have a valid cosmetology or aesthetician license to apply for the program. Its foundation focuses on classic lashing techniques designed to help artists understand the fundamentals of becoming a lash artist. The program is structured around hands-on technical practice with a live model. The volume lashing focuses on the art of the fan including: the lonely fan, fan and grab, Borby Bubble and the pinch methods. Again, extensive hands-on experience practice and demonstration are included in the program. Lobato will not only offer the well-rounded foundation courses in lashing, she will help student’s market, troubleshoot and navigate social media with their business. She wants the program’s graduates to have the necessary experience to be salon ready. “We have provided our students with appropriate time to develop and perfect their skills of lashing. Borboleta raises the bar of quality and professionalism within the lashing industry and that’s what Lobato brought to the Eastern campus. The company is world-wide and provides an education experience designed for students to refine and perfect their artistry of lashing. The three-hour course takes 90 hours to complete during a 15-week period. Contact Kim Mortensen in Eastern’s One-Stop Service Building to register for the program, call 435-613-5462 or email at kim.mortensen@usu.edu. A $300 non-refundable deposit is required to secure a spot in the program.